Price Includes :- Scheduled flights, Accommodation, Swiss Rail transfer. In a picture-card setting with unbelievable views of snowy peaks, the Chalet d’Adrien seems to cling to the mountainside. Price Includes :- Scheduled flights, Accommodation, Swiss Rail transfer. The Lodge is Sir Richard Branson’s own stunning nine bedroom chalet in Verbier. Verbier is one of the Alp’s most exclusive resorts and Europe’s hottest ski spots. Saturday 28th December 2019, 7 nights, Bed & Breakfast. Price Includes :- Flights, Accommodation, Transfer. Boasting views of the Alpine Peaks and Mont Blanc, The new Experimental Chalet hotel offers a contemporary renovation on a traditional chalet offering the best of both worlds for a luxury ski holiday. Price Includes :- Scheduled flights, Accommodation, Swiss Rail transfer. 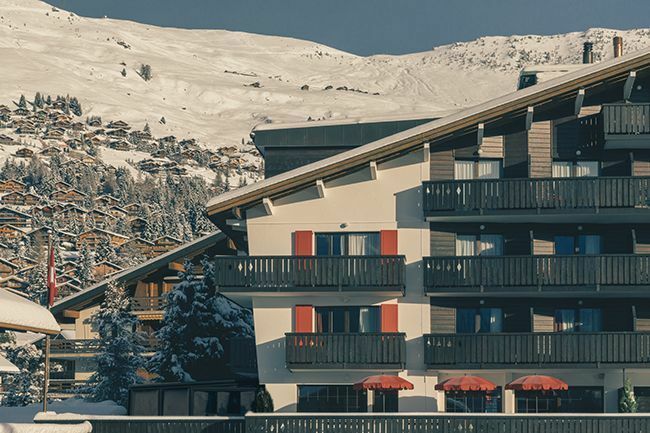 Situated in the heart of Verbier, 50m from the centre of town and a short walk to the ski lift of Medran, the Hotel Le Vanessa is an ideal spot for an alpine break. Price Includes :- Flights, Accommodation, Transfer. Hotel Montpelier is an exceptionally well-regarded hotel locally.